Joe Doyle was neither a Hall of Famer nor a significant ball player, but his T206 Joe Doyle (N.Y. Nat'l) variation is untouchable to all T206 collectors. Same as most of other T206 variations, this late 1980's discovered variation that no one has sufficiently explained. However, one of the most reasonable explanation was the confusion between the T206 image of Joe Doyle and Larry Doyle. In fact, this confusion is responsible for causing the incredibly rare "Doyle NY Nat'l" variation in the T206 set. When the T206 set was printed, The American Tobacco Company originally got their Doyles mixed up, thinking the image of Joe Doyle on this card was Larry Doyle of the New York Nationals, and originally identifying him as being with the "N.Y. Nat'l" team (Larry Doyle's team). 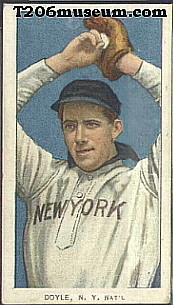 When it was discovered very early in the print run that an error had been made, that the image on this card was actually Joe Doyle of the New York Americans (as opposed to Larry Doyle of the New York Nationals), rather than correcting the league designation on the card (changing it from "Nat'l" to "Amer. "), the league designation was simply removed entirely from the printing plate. Thus almost all known Doyle hands-over-head pitching pose cards in the T206 set are identified with just "N.Y.," as the error cards identifying the league designation as "Nat'l" were corrected almost immediately. This explains the great rarity of the "NY Nat'l" variation. Only a few "Doyle NY, Nat'l" examples are known to have survived, and an authentic example of this impossibly rare error card would very likely sell for over $100,000 even in low grade. There are four Doyle cards in the T206 set, but only one depict Joe Doyle which is in hands over head pose. 99.999% of T206 Joe Doyle card only has "Doyle, N. Y." on the front but the super ultra scarce variation has the "Nat'l" league designation as well. This variation makes it perhaps the rarest card in the hobby with fewer than a half-dozen known. There was a new example discovered in 1999 and it was authenticated by PSA and labelled as trimmed. 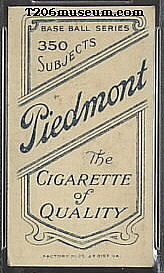 That particular example has Piedmont with Series 350 Factory 25 advertisement. T206 Joe Doyle (N.Y. Nat'l) can only be found with Piedmont 350 Series Factory 25 advertisement. There are less than half dozen examples known to exist.